Second District Records, AU’s student-run record label, brought an impressive group of women to campus for the Women in the Entertainment Industry panel on March 1. Listening to them speak, I was reminded that passion and drive 100% supersede gender-oriented expectations; and, that being a woman means my dreams have no ceiling, despite challenges I may face. Speakers addressed the underlying societal expectation for women to underperform—especially in male-dominated fields such as engineering and sound production—and stressed hard work as the key to rise above the competition. Alisha Edmonson, co-owner of Songbyrd Music House and Record Cafe in Adams Morgan, was particularly impactful. She spoke about how even in the venue that she owns, people often assume she’s just an assistant. She admits she’s felt excluded from the “boys club” by the sound engineers and electricians she works with. But, as a result, she’s taken the initiative to learn on her own. Edmonson now knows how to work every single piece of equipment in the venue space by herself. 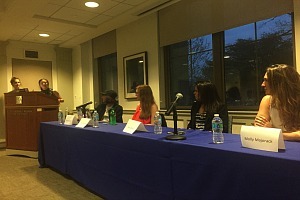 The panel also included Molly Majorack, marketing manager and talent buyer for IMP (owner of the 9:30 Club); Professor Ana Cetina, department head of the Audio Technology program at AU; and Ayesha Chugh, professionally known as DJ Ayes Cold. Other panelists echoed that if you’re underestimated because of your gender, it can work in your favor; you just need to make sure you have the knowledge and skills necessary to perform the job. They stressed that in order to bridge the gender parity, you must make active, conscious decisions to change the status quo. You cannot expect a position because you are a minority. You also need to bring talent and knowledge to the table. Edmonson, Majorack, Cetina and Chugh also stressed the importance of always having a strong “elevator pitch” prepared. “Even if what you want changes tomorrow, it is important to be confident in what you know and what you want to achieve today,” they agreed. For me, the event proved that passion and drive 100% supersede gender-oriented expectations. I feel prouder than ever to be a woman in business. I’m ready to embrace what comes my way professionally—male-dominated, or not. Interested in learning more about Kogod’s Business and Entertainment opportunities? Check out the Business and Entertainment (BAE) program, or click here to learn more about Second District Records.